Do me a favor, don’t celebrate Mother’s Day; I don’t and neither should you. Does that sound sacrilegious? Unethical? Yesterday my newsfeed was flooded with sentimental and touching videos of mothers and the endless jobs that moms do. Yesterday, “Mother’s Day,” all regular activities ceased to exist, all that mattered was Mom. And for moms around the world, it was National Brag Day – show off just how well you were treated on Mother’s day..
Hallmark may have good intentions, but one day of showering Mom with attention doesn’t do justice for the right type of celebration every Mom deserves, doing a job that’s 24/7/365. If you really want to know what moms want, what makes moms feel appreciated, I’ll tell you. Let’s start at the beginning; as moms leave Labor and Delivery at the hospital, there should be a marching band, confetti and a gift certificate for a day at the Spa presented to every mom (sponsored by Hallmark). That’s the least of what I expect when I leave the hospital. I’m always disappointed when all I get is a grumpy security guard who barely grunts a hello. Don’t you know what I did, I want to shout, I gave birth!! Where’s my medal?! Where’s the celebration!? Ever tried grocery shopping with some little helpers? How about every grocery store having a moms-only line, where there’s no little treats and candy bars within arms reach of every toddler. Instead there are bright flashing lights and a clown entertaining little kids while moms wait in line. And shopping carts with a five point harness so moms can shop without worrying about wiggly toddlers trying to climb overboard. Now, that’s what I call appreciating what moms do! Parking lots leaving the closest spots to the store for moms only, so it’s not necessary to balance a car seat, toddler and 15 lb. diaper bag in one hand while looking for a shopping wagon. And airplanes – how about having supervised kids play area on all aircrafts, so moms can sleep in peace on the plane and avoid evil looks of grumbly passengers. And dedicated airline staff who are equipped to help moms go through security at the airport, and then put babies who were awakened for security check back to sleep. These are things that make a mom feel valued! 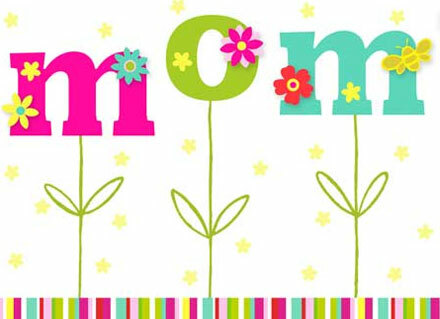 How about a “Moms Don’t Cook Day” every week and all restaurants offer free dinner, saluting moms around the world. Maybe the laundromats can offer free pickup, wash and drop off to honor us every now and then? Instead of carpool lane, there can be a moms only lane, dotted with attractive riddles, pictures and games to keep the kids busy. Drive through coffee shops can also carry sippi cups and pacifiers, something that is always left behind; and every mom knows the hassle of having to go back once you are finally on the way. Now that’s a thoughtful way to show respect for moms. It’s time to upgrade public bathrooms and make them secure enough for moms to stop if needed – because moms do need to go sometimes too! – and not have to worry about a toddler opening the door, or better yet, peaking under at the stall next door. And because we appreciate moms so much, how about a Mom’s Room in all public areas, to nurse the baby, freshen up or reapply lipstick. And for moms of big, grown kids, how about special random promotions like take mom out to lunch on a tuesday in February and get a free dessert? Mother and daughter manicures for half off. Buy one for mom, get one for yourself for free. Any time of year. Take mom for coffee, get a free pastry. It should be woven into everyday life, and not designated for a day in May. I walked into Starbucks last night with my husband; not because it was Mother’s Day, but because I had a babysitter. And they were out of soymilk. The frazzled guy explained Mother’s Day wiped them out. Poor moms who had to wait all year to be taken to Starbucks. Yes, my dear fellow moms, coupons, cards and banners don’t do the trick; if society wants to really promote celebrating moms for the incredible work we do, it’s time to revamp the system. I don’t make a big deal out of mother’s day in my house. I don’t want my kids to think one day a year is good enough to surprise me with breakfast or write me a little poem and make cards with hand prints . I don’t want them pushing off doing nice things until Mother’s day. Every day is an opportunity; I want them to do nice things for me on any given day. My mother always says “Every day is Mother’s day” and she sure was on to something. That’s how I am raising my kids, and that’s how I try to treat my mother too. C’mon fellow moms, join me! Don’t be satisfied with one day!